Looking for the latest information on all things Xbox Two related? You’ve come to the right place! This page will be updated regularly with every snippet of news, every rumor and every prediction that we can make as the future generation of game consoles draws closer. We don’t know for sure what will follow the Xbox One, but we are sure that it will be an incredible piece of technology and so we want to keep you up to date with the very latest as it happens. Feel free to get involved by adding your own predictions to our forums and comments to these news updates and the other pages on this website. We’d love to hear your thoughts and theories on the future of console gaming, so get involved! All of the Latest Xbox 2 News! On a recent investor call, Ubisoft's CEO Yves Guillemot said that they believe the PS5 and Xbox 2 are at least two years away. This is due to the release of the Xbox One X in November of 2017. This would make sense, but it also gives the Xbox One X a short lifespan. Even so, if Sony comes out with a new system, Microsoft will surely answer with something of their own. We have some concrete evidence on the specs of Xbox One X, thanks to a leaked whitepaper for developers from Microsoft themselves. Among other things, the paper details some of the system's hardware and how developers will be able to utilize it. Meanwhile, a certain developer has spoken out to comment on the nature of Project Scorpio. Check out the full article for all the latest info! Phil Spencer doesn't want you to worry about how much "the most powerful console ever built" will cost. He has a plan, but will he give us any details? Well, we know for sure that it should fall in line with what people expect. Find out more in the full post! Microsoft's E3 2016 press conference included two major console announcements. One of which was the Xbox One S, but the other came as a complete surprise to all but the most dedicated of readers here on Xbox 2 Gamers. Project Scorpio, a massively powerful 4K console was announced. Find out more in our full article! Microsoft is standing strong in the face of PS4.5 rumors. Phil Spencer says they're not interested in an upgrade, they want to make big steps forward. Is Phil talking about Xbox 2? Find out in the full article! Microsoft announced that their HoloLens augmented reality headset is "indefinitely delayed." This tells us that we won't see the new technology until after the Xbox 2 is out! Find out why in the full article! February 2016 - Developers Already Planning For Xbox 2 Developers are already thinking about how games will look and play on Xbox. What are they thinking it will be like? Find out in the full article! January 2016 - Grand Theft Auto VI Coming to Xbox 2! New rumors are showing that Rockstar is most likely working on Grand Theft Auto 6! With a supposed release date of 2020, it will be ready just in time for Xbox 2. Find out more in our full article! December 2015 - Xbox 2 Confirmed! Phil Spencer, head of the Xbox division, has confirmed that there will be another console from Microsoft. Find out what he said, and what it means in our full article! December 2015 - Microsoft Bringing Windows to Xbox Microsoft announced that Windows 10 would be a service, and the last operating system from the company. They're also bringing the OS to Xbox, so what does this mean for Xbox 2? Find out in the full article! With news that Microsoft has laid off the entirety of the Israeli team working on the HoloLens, we have to ask: Is the future of the HoloLens in danger? Will we still see it on the Xbox 2? Find out in our full article! Gaming Bolt Asks: Will Xbox Two be a Console or a Service? Zoltán Pozsonyi from Neocore Games on the future of console gaming weighed in over at Gaming Bolt, asking the interesting question of whether or not the Xbox Two will be a console or a service like Netflix? He makes good point in his article around the limitations of physical consoles. Check it out, it's worth a read! Our sister site, Xbox One Experts has posted their own Xbox One vs Xbox Two piece. Do these predictions line up with our own? Find out by clicking the link above! Former Xbox Boss Talks About Next Generation Consoles Robbie Bach, the former Chief Xbox Officer and President of Microsoft, spoke with GeekWire about his new book and the Xbox 2. Find out more in our full article! Techradar Weighs in on Xbox 2 Techradar recently posted a full breakdown of what they believe the Xbox 2 will be like. Check it out and see if they're predictions match ours! Microsoft Buying AMD? AMD is the manufacturers of various electronic devices, but most importantly, they make the chipset for the PS4 and Xbox One. If Microsoft were buy out AMD, it would force a huge change in the industry, and it would save Microsoft a lot of money. Find out if this is even possible in our full article! Will The Xbox Two Release Early? Microsoft isn't winning this generation. With the PS4 running ahead in sales by a large margin, could this push Microsoft to release the Xbox 2 early? Check out what Bidness Etc has to say about it. 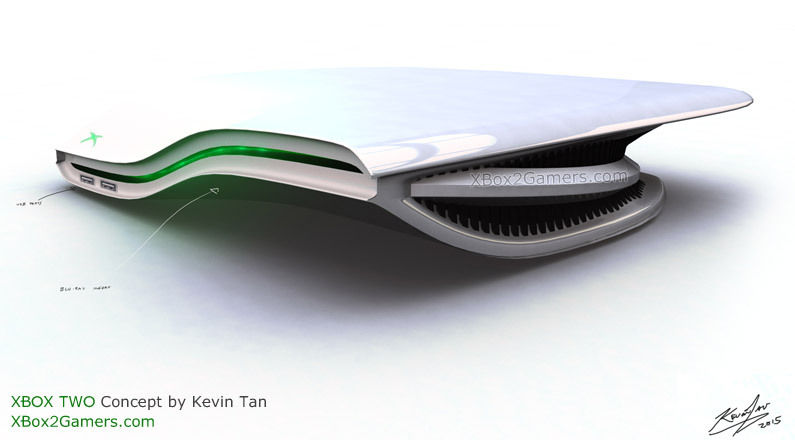 Will The Xbox 2 Include Kinect? The Kinect has had a rough life, with poor support on both the Xbox 360 and thus far on the Xbox One. Does Microsoft have any plans to support it in the future, or is the Kinect dead for good this time? Find out in our full article! How Does the HoloLens Affect Xbox 2?> Microsoft's HoloLens looks to change the game, literally, buy using augmented reality to change the world you see around you. How does this affect the Xbox 2? Find out by clicking the link above! Will the Xbox 2 Have a Hard Drive, or Will it Be Cloud-Based? Hard drives are progressing at a rapid pace, but will the Xbox 2 leave physical media behind and stick to a cloud-based system? We weigh the possibilities in our full article! on the controller their should be two modes first mode play from consle and two on the controller the screen on the controller you can play xbox like if you go to shcool you can play xbox it would be cool and i would not care if it gets very pricey like 600 700 or 1000 ill buy xbox2! !